A Journey through a world undiscovered were myth and reality fuse together and originate fantastic images ennobled by the exuberant and mysterious Nature. “ Images Recetary” by Paula A. A look through-out the routs of the spices, traveled by the medieval voyagers who recognized and qualified this exotic and exquisite group of plants. Senses and expression join together and generate a recipe collection of images. Workshop and Conference: project that recovers history trough Art. A look towards the diaries and archives of this wise professor who worked with colombian artists, and left a huge legacy for Art and Science. We can appreciate the extensive work of art and research represented in the 2.945 colored sheets of qualified botanical species. With a previous artistic analysis; this workshop invites you to recreate all the processes followed by Mutis and his artists. From the difficult journeys searching and collecting natural pigments to the work in the table where composition, skills and discipline are proved. Invites children to explore and feel the contact with nature, then express their perceptions on their own journey’s diary. The children can learn about plants and use their creative skills ,telling stories through images. 2009 Representative Exhibition: about Graphic Art in Colombia at Cultural center Gabriel García Márquez . From the series “El Páramo” by Paula A. The Páramos are beautiful places full of accidented, mostly glacier formed valleys and plains with a large variety of lakes, peat bogs and wet grasslands intermingled with shrub lands and forest patches. This series of lithographs reflects the magic and mysterious echoes of a marvelous but vulnerable ecosystem. This book was published by the Public National Library of Colombia. In frame of the commemorative bicentenary to death of erudite José Celestino Mutis. The Book tells the history and illustrate with images, the whole journey of Mutis since he weigh anchor from Cadiz Spain port, his amazement watching the exuberance of the new world, the difficulties he had to accomplish the Royal Botanical Expedition and the legacy he left for art, science and ideas for independence. In this exhibition the viewer is invited to take a closer look and rediscover a forbidden technique in history “the miniature”. Incredible detail, refined skills and true expressions are qualities to enhance in this exhibition. People can recognize touching portraits of endangered Colombian specimens as mammals, reptiles birds and plants between others. 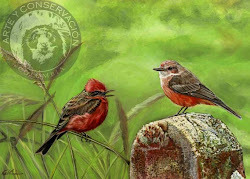 This initiative started from an alliance we stablished with Proaves foundation; a Colombian non-profit organization that focuses on the study and conservation of our biodiversity, especially birds at risk of extinction and their habitats, in partnership with local communities. This Poster with the endangered Colombian Yellow-eared Parrot. (Ognorhynchus icterotis), was inspired, on the 10 years of hard work for conservancy programs developed by the Foundation. Thanks to ProAves Foundation and with the support of American Bird Conservacy, Bird Life, World Land Trust-US, US fish & wildlife service, Smithsonian National Zoological Park; we achieve the Poster of the Blue-billed Curassow (Crax alberti) a colombian curassow threatened by habitat loss. Is a dynamic and educational event where diverse activities for all the community, especially kids and youngsters living closer to the Blue-billed Curassow Natural Bird Reserve, take place, where ProAves focuses conservation efforts for this species.The Festival intends to increase the interest of the community in the conservationist programs carried out by ProAves, changing the way people sees and thinks about the Blue-billed Curassow. Thanks to ProAves Foundation and with the support of American Bird Conservacy, Bird Life, World Land Trust-US, US fish & wildlife service, Smithsonian National Zoological Park; we achieve the Poster for migratory used by ProAves, to carry out activities of conservation and environmental education. The objective of this festival is to promote the interest of the communities in the knowledge of migratory birds and the importance to preserve their habitat. In addition, the festival seeks to strengthen and consolidate the network of organizations and people committed to wild birds’ conservation in the country. Migratory birds make a dangerous trip and it’s the duty of the tropical countries to ensure their survival. “Natural History of Pencils” by F. Emmanuel. Series of a “Natural history” kind of drawing that takes us on a journey trough the possibilities of Language and a methodology to evocate paradoxical images.